It’s time to put away your snow blower and shovel and dig out the lawn mower! Now is a great time for some lawn mower maintenance. Follow these 6 steps and you will be ready to mow! Change the oil. This is one of the most important steps. Also check the oil periodically during the season to make sure it’s at the correct level. Check the air filter. The air filter typically doesn’t need to be replaced every year. If it is slightly dirty you can clean it, but if it is very dirty or damaged, it is a good idea to replace it. Check the spark plug. If you are having trouble starting your mower, this can be a common cause. If the plug is very dirty or dark on the end, then it may be time to replace it. Sharpen your blade. You can sharpen the blade on your own with a metal file or a bench grinder, or you can have a pro do it. Either way a sharp blade is vital to having clean cut grass. This practice should be done a couple times during the season. It may be a good idea to buy a spare blade to use while your other one is being sharpened. Setting the mower height. For the best results, set the height at 3 inches during the cooler times of the year, and 3.5 inches during the summer months. A higher mowing height can aid you in keeping the weeds and crabgrass out of your lawn. 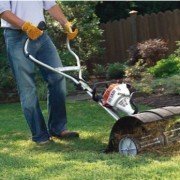 This will also result in thicker grass, and a lawn that will not dry out as quickly. The last step is to have fresh gas. Old gas is the number one cause of having trouble starting your mower. If there is old gas in the mower, drain it and replace with fresh gas. The reason turf performs so poorly in shaded are-as is because of a of lack of sunlight. Grass is like most other plants, it does best with an abundance of sunlight present. Some varieties of grass perform better in low light situations such as ryegrass and fescues. 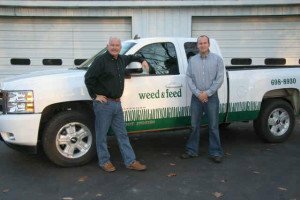 The most popular and desirable grass in West Michigan is Kentucky Bluegrass. It is a preferred grass and excels in full sun, but it will not grow in the shade. To make matters worse, every year the canopy of your trees grows larger and thicker, making it even more difficult to grow grass beneath them. Unless drastic tree trimming or removal is done, over time, things tend to get worse, not better. Sodding these areas is not an option. The primary grass used in sod is Kentucky Bluegrass. Bluegrass will not grow in the shade. So, what can be done to improve these areas? 1) Reseeding. You can reseed with a shady mix of grass seed. This will work especially well in areas that receive a mixture of sun and shade throughout the day. Just remember: you have not improved how much sunlight can reach the ground, so your reseeding results may be short lived. 2) Tree Trimming. Trees can be trimmed and their canopies raised and thinned out allowing sunlight to penetrate. After 2 or 3 years, the canopy usually will have filled back in and more trimming will be neces-sary. 3) Bark Mulch and plants. 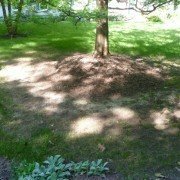 Rather than constantly battling shade, spreading bark mulch around the base of the tree can be a great option. Another idea is to add a shade loving ground cover like pachysandra or ground ivy, or some shade loving plants like hostas. 4) Accept the thinner grass and enjoy the trees. Sometimes we need to accept that our trees are a wonderful asset to our properties but aren’t going to make for the best conditions to grow grass. We care for many homes that don’t have trees, and would love some trees despite the problems they bring. 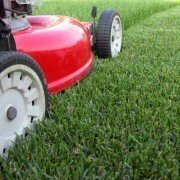 Make sure you are using proper cultural practices in these areas: Mow the grass at 3 inches or higher and keep these areas properly watered. 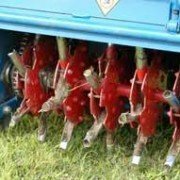 Reduce compaction with aeration, keep grubs out of the lawn, along with a good fertility program to have the best chance at growing grass in shady areas. Thatch, as defined by Dr. James Beard, is “a rightly intermingled layer of dead and living stems and roots that develops between the zone of green vegetation and the soil surface.” In the most basic sense, thatch is what gives the turf that “spongy” feeling when you walk on it. If you have ever walked on a recently established turf, you may have noticed that it feels very firm. That is because a thatch layer has not yet developed. Dethatching is an aggressive procedure that rips and tears the turf, resulting in only a small amount of thatch reduction. Most thatch consists of living roots and stem and is not removed by power raking. 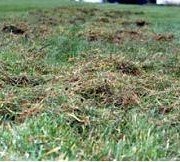 You also may be surprised that grass clippings do not contribute to thatch accumulation. Most thatch is attached to turf plants or their root system. Grass clippings are highly biodegradable; therefore, making it best to return them to your lawn. Instead of dethatching, aeration is recommended. Aeration removes cores of soil from the lawn. These cores break down and redistribute valuable nutrients to the soil and also topdress the soil with a thin layer of dirt which reduces thatch. The holes left in the lawn provide passageways for air, water, and nutrients. As the soil and roots expand to fill the holes, the surrounding soil is allowed to loosen, reducing compaction. So, if you’re feeling ambitious, go head, power rake your lawn. It will probably be a good workout, but of little benefit for your lawn.